In a lot of video games where you embody an established avatar you are given full context and a back story to flesh them out. 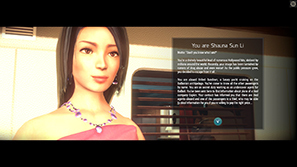 Your character's actions are predetermined, save for multiple routes and dialogue options. This is absolutely not the case in Velvet Sundown. You are given a brief overview of the character and one or several objectives at the start of a game. However, what you do and say from there is entirely up to you. Velvet Sundown is an online role playing game. One of the scenarios is available free and that is the only one I have played. Games involve four to six players on the Velvet Sundown, a luxurious yacht. Each player is given a random character (I think there are eight in total from my count) and objectives. Each character has a set objective and there are some that randomly rotate. 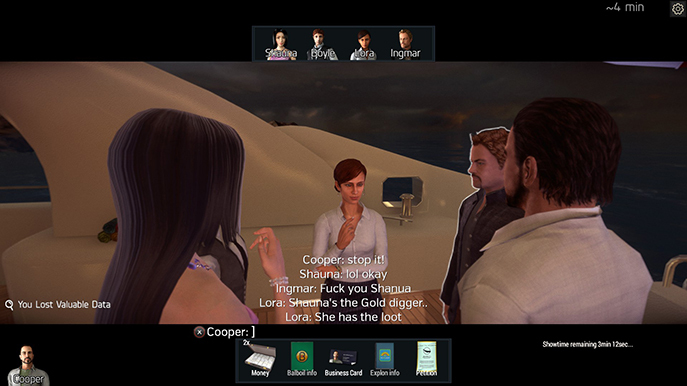 For example, Boyle, the bartender's character objective is to serve drinks to the other players – a choice of beer, whiskey and a Bloody Mary – and Cooper's main is to collect signatures on a petition to save the whales. On top of these you may also get a random one; either as an agent or a thief. This is where the game gets interesting. 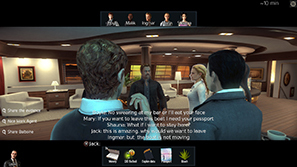 At the start of the game you do not know which of the other characters are agents or the thief. There are two factions – Explon and Balboine – each with their own agents. 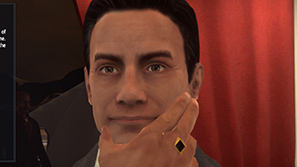 I believe in a game with six people there will be two agents on each side, one thief and one innocent purely there for their character objective. Someone holds precious data for both sides about a potential sabotage of the company's oil rig. In the thirty minutes each game lasts you have to find out who the agents are, find and work with the agent on your side and acquire the data. Each agent has a CID device they can use on each other to reveal which side they are on. The thing that made this game stand apart is how you interact with other players. You click on a character to request a conversation and can type what you want. There is a text-to-voice system which is surprisingly good and highly entertaining. Each character has their own voice work and it deals with words well – I managed to get a character to say antidisestablishmentarianism without much trouble. This not only adds huge amount of character to the game, it makes every play through different. Of course, there are people who abuse this feature by constantly swearing and spamming. This has decreased considerably since the game launched, as people testing it out because it was free have now gone and people that enjoy it now understand how the game works. Still, I did have a giggle or two at some of the silly things people were saying. I've found each play through to differ greatly. Sometimes people leave the game early which is frustrating. You can tell by their character holding their nose (I'm not really sure why that pose was chosen for AFK) but Velvet Sundown has a good system in place where they cannot join another game till the current session is over. This stops people quitting because they have been given a character they dislike. However, a lot of players now embody their characters well and put in the effort to complete their objectives properly, rather than saying “I'm this agent, what agent are you?”, for example. 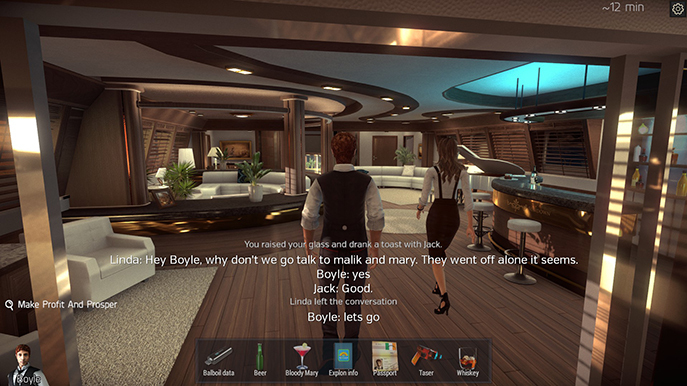 In one game I was Mary – works on the yacht and required to collect passports – and Dunla asked if she could talk to me outside. We went outside and she began a long story about this orphan she was trying to find foster parents for. The effort the player went to in making up this story was so impressive I felt obliged to take responsibility. One game I teamed up with Linda in secret and manipulated everyone else into giving us what we needed. Another, I talked to Boyle trying figure out who was who and started formulating a plan. The fact that I've written this without checking the game for names and different objectives shows how engrossing I've found Velvet Sundown. It is a very refreshing change of pace from the games I've been playing lately. There have been some problems though. One update caused an error on start up that could not by bypassed, sometimes it takes a long time after typing something for it to appear and the text-to-voice feature hasn't been working frequently in the last couple days. When everything is working though, the anonymous interaction with other human players really makes the game interesting. Different people approach their objectives in different ways and its fun to see what stories they'll make up for their objectives. It looks like there will be a different scenario each week for members using the free version. I'd recommend you checking this out. For a start it's free. From my experience I'll say one more thing. Do not just play one game. Your first game will be confusing; it is not immediately clear how the game works and you'll spend most of it laughing at the text-to-voice system (presuming it works). Once you have a better idea of the mechanics, you'll realise this isn't just a novelty experience, but a well built and surprisingly engrossing online role playing game.